In the realm of higher education, MassMailer is able to facilitate student, faculty, and employee communication. MassMailer can be used for everything from scheduled announcements to triggered alerts, making it easier to keep all faculty staff and students on the same page. Here’s everything you need to know about MassEmailer and its advantages for higher education. Why should you use MassMailer for your institution? MassMailer is easy-to-use, scalable, and trackable. MassMailer has an intuitive platform that can be easily adopted by any organization, and its infrastructure allows it to scale to any institution’s size. Not only can MassMailer schedule large numbers of emails (including attachments), but it can also track these emails. Email status alerts, such as alerting students on the status of their application. Maintaining email lists, to ensure that all of the contact information is accurate. Support ticket emails, to let both students and help desk personnel know about the status of issues. Donation requests, to reach out to those who may be able to provide additional funds for the school. Student recruitment and communication, connecting with prospective and current students. Student education and events, to provide student newsletters and other scheduled emails. Faculty support, to provide information to faculty members that they may need. These are only a few of the advantages of using MassMailer as a mass email solution for Salesforce CRM. While Salesforce does provide powerful customer relationship management functions, it has some limits. With Salesforce, you cannot send more than 5,000 emails a day. It’s more difficult to track emails through Salesforce and since Salesforce doesn’t check on your email deliverability. Consequently, you may not know whether your emails are actually getting through or whether they may be marked as spam. MassMailer directly integrates with Salesforce to provide additional functionality to the award-winning system. With MassMailer and Salesforce, you can eliminate Salesforce email limits, while also checking and improving upon email deliverability. 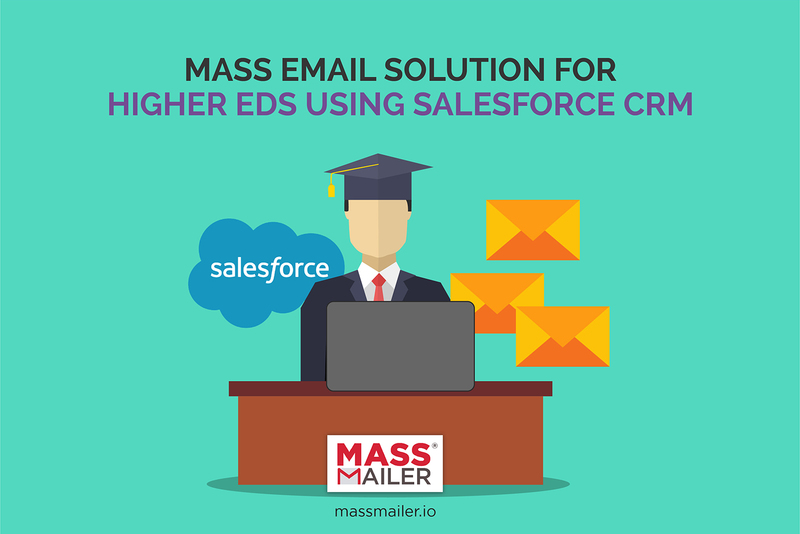 Through MassMailer APIs, your email solution can be customized to suit your institution—and you can leverage both MassMailer and Salesforce tools. MassMailer makes it possible to keep students and faculty members connected at all times. With traditional Salesforce limits, faculty members may struggle to connect with their students on a reliable basis. Teachers may need to send out notifications, alerts, events, and schedules, and they may quickly exceed limits and be unable to notify their students. Further, advisors and teachers may need to be able to see whether students have opened their emails or when they’ve last read their emails. Salesforce and MassMailer make it possible for advisors to not only send large volumes of emails, but also track whether thee emails arrived and whether they were interacted with. Through this, they can build a better relationship with their students. The University of Colorado provides an excellent example. When MassMailer was introduced to the University of Colorado, teachers were struggling to keep students updated. With 225 emails sent to 80,000 recipients every month, it wasn’t possible to acquire the volume that they needed through Salesforce alone. After switching to MassMailer, they were able to achieve a 63% email open rate, and send all the emails they needed to—thereby improving their communication with their students. MassMailer Email Verify. You can preview your emails and verify the way that the content will be received by recipients. As many people are now using a variety of platforms to view their emails, MassMailer Email Verify can ensure that emails are properly rendered across any number of devices. This is especially important when tens of thousands of students and faculty members may be receiving critical emails. MassMailer Email Monitor. The email monitor solution improves upon deliverability, analyzing emails to make sure that they aren’t coming from a blacklisted domain or IP, in addition to making sure that the content doesn’t link to any blacklisted domains. The Email Monitor solution will make sure that all emails are being sent properly authenticated and to the correct specifications. With a tiered pricing service, MassMailer can scale to any organization. Pricing for MassMailer is available based on the features that are needed, the number of monthly users, and the number of users sent per month. An institution of higher education will be able to choose the MassMailer tier that works best for them. To start a free trial, install MassMailer today from Salesforce AppExchange. Discounts are available for higher education.